if you haven't noticed, all of the new recipes that we have been trying lately have been "healthy" alternatives to some of our favorite foods. yup, i guess you can say that both of us have been getting a little depressed about what the bathroom scale has had to say recently. now that winter is officially over, we figured that we needed to whip ourselves back into shape! so, in addition to all of the other delicious things that we made this past weekend, we also made sweet potato veggie burgers. we decided to grill the veggie burgers instead of frying them in a frying pan. they were super tasty with a few slices of fresh avocado and a whole wheat bun. 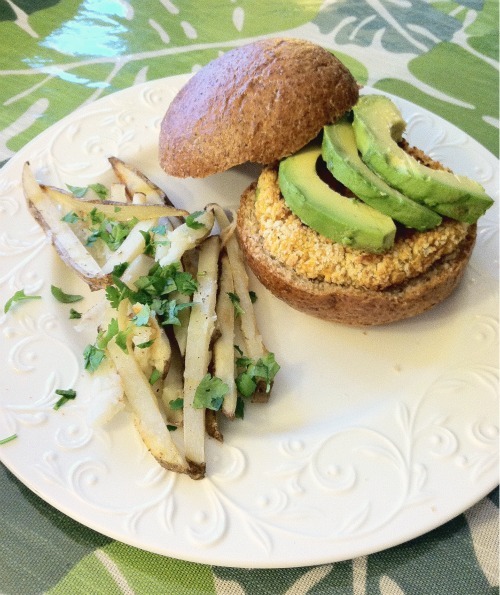 we paired our veggie burgers with baked garlic and cilantro fries too, which were a healthy alternative to deep fried fries. Oh, man. This looks so good! the avocado looks soo good...i wouldn't have ever thought to do this! UM YUM! I need to make this!